Carlee and I were talking about the roulade that her aunt Linda used to make. This made me think of the steak rolls that my mother used to make when I was a child. They were one of my favorite meals. I immediately called her to get the recipe. She wasn't exactly sure how she made them but as we talked about it she remembered. I think we got it pretty close. My mother, MawMaw, had probably eaten something similar when she was out to dinner one night and tried to replicate it at home. This is what she came up with and it was an instant favorite of mine. In my early marriage I made this several times. Somehow it found its way out of our lineup of meals. I'm so glad that this recipe is back in our lives. She recalled discussing what she made for dinner one night with some of her friends as they were playing golf. It just so happens that there was an Italian lady or two in her group. They knew immediately what she was talking about. They called it Braciole. Pronounced bra jewel. Nobody will really care what it's called. Let's just call them the best steak rolls ever! Stir together all of the filling ingredients. Smear about 1/4 Cup of the filling each piece of steak. Roll them and secure with a couple pieces of the twine. Brown the steak rolls as you work and place them in a 9x13" casserole. Pour the spaghetti sauce over all of the steak rolls. Cover with foil and bake at 350° for about an hour. Remove the strings before you serve them. Hello Carlee, haha I know exactly what you are talking about! I made such a mess out of that name when I learned what it was from my husband and boy did he have a laugh! :) I was taught how to make this from my husbands Italian Aunt. I love this and have not made it in a long time. It's hard when the pronunciation of these words isn't intuitive... especially when you've been saying it wrong for years! Thanks, Julie! I used to see it all the time, but have had a harder time finding what I was looking for lately. I used to use similar steaks for swiss steak but now they are all tenderized and don't look like they'd hold the filling well! I hope you find some and give it a try! I'll take it! I love Italian and steak so what a great combo! Would be so fun to serve these at a get together and wow guests!! Downright fun and yummy!! It is perfect for a dinner party because the "hard" part of the prep is done in advance. You could even roll them a day ahead and just bake them of the day of! This looks like a very comforting recipe. I bet leftovers are good too! 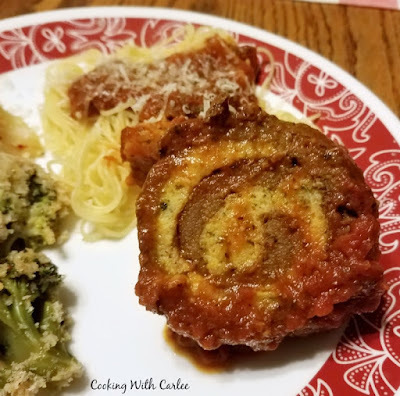 Oh we LOVE braciole in my house! My mom is Italian and used to make this all the time. It's been ages since we've had it. SO good! I have only had it a handful of times. I think we need to make it more often! I love rediscovering old favorites too. It usually makes me wonder why we ever stopped making them, but it is fun to bring up the memories! Thank you! Yum, I love a good steak roll, this sounds wonderful! Thanks for sharing at What'd You Do This Weekend?! Thanks for hosting, have a wonderful Mother's Day! Wow! 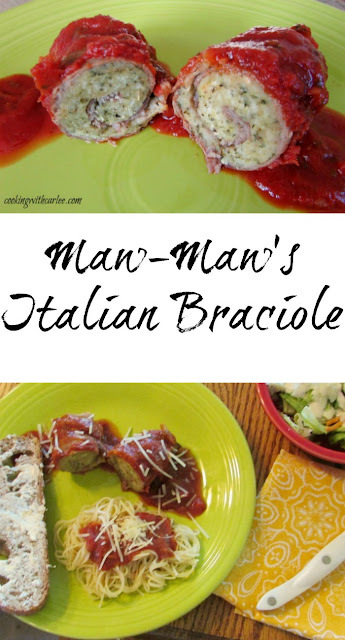 I've never heard of Braciole, where have they been all my life? 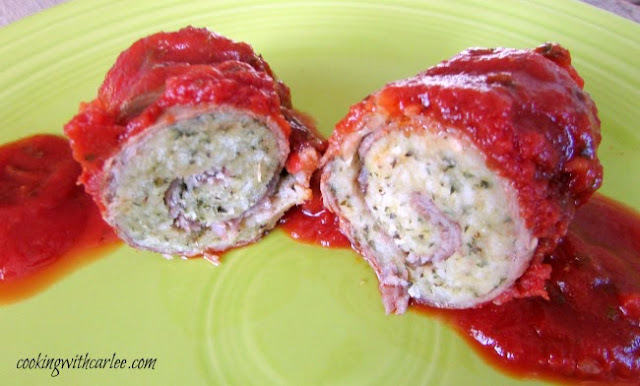 They look really delicious, pinning this recipe, it is a must try! I'm sure my husband will love them!!! My brothers were amazed! I don't know why MiMi has held out on us so long! Thanks, Nikki! I can't wait to make this awesome and flavorful recipe! Thanks so much for sharing them with us at Full Plate Thursday and come back soon! This sounds so interesting, I've never even heard of Braciole. I bet it tastes wonderful! It is so good! 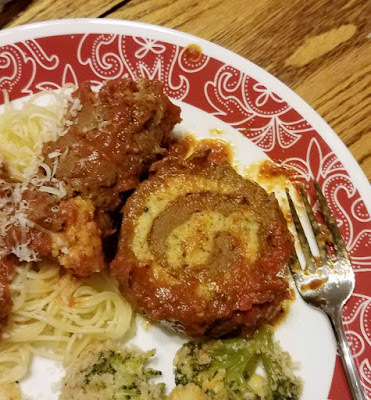 My brothers thought it was like a meatball crossed with a steak, which kind of makes sense! I hope you love them!! I can't wait to hear how it goes!